(Macao, Dec. 03, 2018) – Come and discover the real joy of Christmas at The Parisian Macao on Dec. 8, 2018 for the Winter in Paris Charity Christmas Fair, where visitors can help raise funds for Caritas Macau while enjoying a fun, festive day with friends and family. 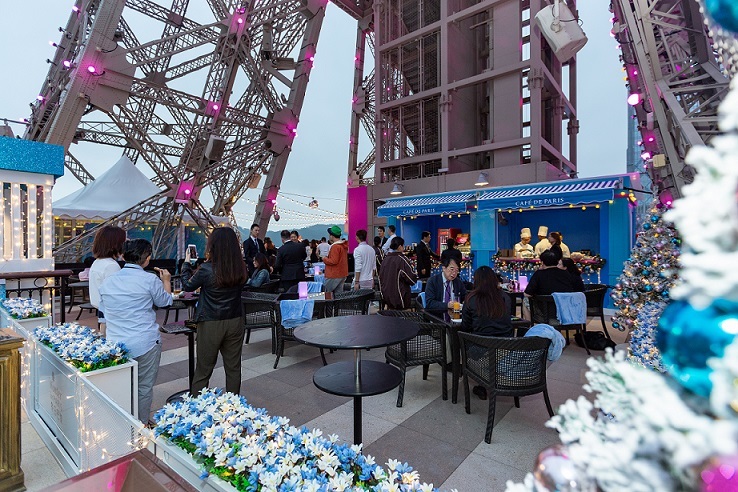 For the Charity Christmas Fair, The Parisian Macao’s Eiffel Tower Level 7 viewing platform will be transformed into a fabulous outdoor winter wonderland featuring a Christmas pop-up market, a playground and games for children, an ice skating rink, live entertainment, workshops and delicious winter food and drink. And there will be a very special guest in the form of Santa Claus himself for children (and the young at heart) to meet and take selfies and pictures with. Organised in partnership with the International Ladies’ Club of Macau in support of Caritas Macau, visitors will be thrilled with the colourful Christmas market overflowing with unique Christmas gifts and decorative items, including jewellery and fashion accessories, international gourmet food and beverages, Christmas pine tree decorations, paintings, books and much more. At the Kids’ Corner children can try their hands at a range of arts and crafts including cupcake, gingerbread and cookie decorating, while they can also be decorated themselves with face painting and glitter tattoos. The fair’s workshops include Cooking Corner, baking winter delicacies with Macau Sweet Ideas, cupcake decoration with Lina Lenço and a special themed Christmas decoration-making workshop with French florist Oulala Flower to add some Parisian savoir-faire. A busy festive schedule of entertainment includes a Santa Claus meet and greet, The International School of Macau Crescendo Choir, the Blue Note Band, street performers, ballet dance, storytelling and a lucky draw. So bring the family and friends to support a worthy cause, pick up a last-minute Christmas gift, try ice skating, meet Santa and much more at Winter in Paris Charity Christmas Fair! Photo caption: Winter in Paris Charity Christmas Fair will take place at The Parisian Macao on Dec. 8, 2018, where visitors can help raise funds for Caritas Macau while enjoying a fun, festive day with friends and family. Since 1984, the International Ladies Club of Macau (ILCM) has been committed to help those in need. Our organization is 100% run by volunteers and every dollar donated to our organization provides practical assistance to Macau charities. Charitable organizations supported by the ILCM include residential homes for children and the elderly, the handicapped, and for the disadvantaged in our community. We also provide financial support for seminars and campaigns to raise awareness, education and understanding in the areas of domestic violence, drug abuse and family issues. We purchase important medical equipment for those in need, and help children get the much needed love, support, equipment and education they need, and that others can’t provide. The ILCM is proud of its long history working in partnership with the Macau Government and the Macau Social Welfare Institute, helping to make a difference in many lives. The ILCM is often a point of contact for local groups that care for those who “slip through the cracks” and live in desperate situations. Many of the organizations we support operate on a very restricted budget and are reliant on our fundraising efforts to support the important work they do at a grass roots level in the economically challenged areas of Macau. For more information, please visit www.ilcm.org.mo.